As a child I dreamed of growing up to be a vet (as in veterinarian—I had no interest in being a war veteran. I make love, not war. Plus I look terrible in khaki). Due to my fear of blood and even bigger fear of math and science, this dream didn’t come true. I became a teacher instead and ended up working with animals nonetheless… small human ones. Little did I know I would have to deal with bloody noses and knees and TEACH math and science. My love of animals has been passed down to my children. My daughter is a mini Doctor Doolittle who quite literally talks to the animals. We have enough mammals living under our roof that she’s never hard pressed to find a conversation partner. This boy has so much love in his heart, he has plenty to share with all of dog’s creatures (I know. I can’t help it—it’s the atheist in me). Our latest furry family member is a five month old Skinny Pig called Ernie, named after my grandpa. I fear his living quarters in my son’s bedroom were too chilly at night because last week he caught a cold. We’ve since moved his enormous cage into our kitchen which now looks like some brutish restaurant where the food is fresh. Like, really fresh if you catch my drift. Poor Ernie stopped drinking and he picked at his food. One eye oozed a greenish sticky sludge and I knew he needed help. Google and I suspected an Upper Respiratory Infection. I decided to listen to his lungs with my stethoscope to confirm. Yes I own a stethoscope. When my daughter was a baby we fed her through a nasal gastric tube. Before each feeding we had to listen to her chest to ensure the tube was inserted correctly to avoid accidentally filling her lungs with liquid. Yes, it was as unnerving as it sounds. 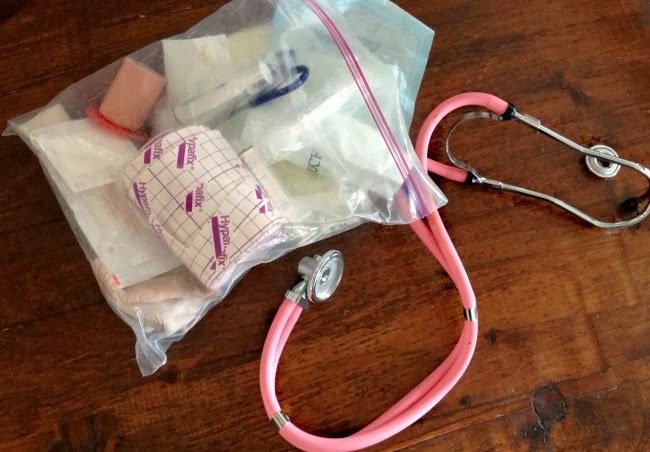 As I dug through a bag of medical supplies in search of the stethoscope, I couldn’t help but think about what we had been through, medically speaking, with our youngest child. It all seemed so long ago, many of the details forgotten or blurred with time. And now here I was once again, listening to the beating heart of a soul depending on me for its life. We took Ernie to a small animal vet. $240 later and he is on the mend. I learned to administer oral antibiotics to a guinea pig through a syringe and how to gently apply eye ointment to eyes that bulge and plead for them not to be touched. Then I taught my son how to do it since he’s the one who may grow up to be a vet one day, while I remain the teacher. What’s a GP GP? A Guinea Pig General Practitioner of course.